Professor Benjamin J. Cohen (Department of Political Science, UC Santa Barbara) and Tom Wong (Department of Political Science, UC San Diego) will discuss UCLA Political Science Professor Margaret Peters' new book, "Trading Barriers: Immigration and the Remaking of Globalization." Why have countries increasingly restricted immigration even when they have opened their markets to foreign competition through trade or allowed their firms to move jobs overseas? 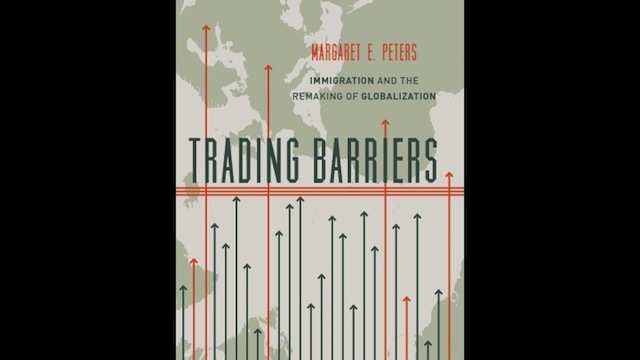 In Trading Barriers, Margaret Peters argues that the increased ability of firms to produce anywhere in the world combined with growing international competition due to lowered trade barriers has led to greater limits on immigration. Peters explains that businesses relying on low-skill labor have been the major proponents of greater openness to immigrants. Immigration helps lower costs, making these businesses more competitive at home and abroad. However, increased international competition, due to lower trade barriers and greater economic development in the developing world, has led many businesses in wealthy countries to close or move overseas. Productivity increases have allowed those firms that have chosen to remain behind to do more with fewer workers. Together, these changes in the international economy have sapped the crucial business support necessary for more open immigration policies at home, empowered anti-immigrant groups, and spurred greater controls on migration.